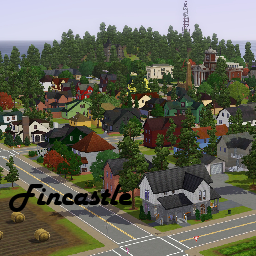 Mod The Sims - Fincastle - "An island of Americana"
Fincastle is a little slice of the American Dream on an island of fir trees. Ideally stylized with a happy, homey tint, this custom, fully built world is a complete experience. Inspired by the towns and cities that I have lived in Indiana, most of Fincastle's homes are made in a style that predates the 1960's. 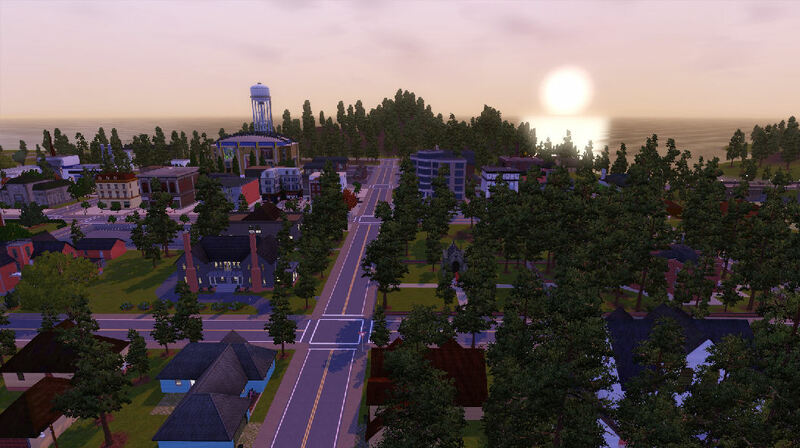 From mansions to trailers, from parks to warehouses, the town is perfect for sims from all walks of life. Founded in 1885 by Forrest Martin Fincastle, a brief, but rich, history of the town can be read through lot descriptions. * 84 residential lots of which 17 are starters under 16,500. Least expensive furnished lot is 11,708, and the most expensive is 382,955. 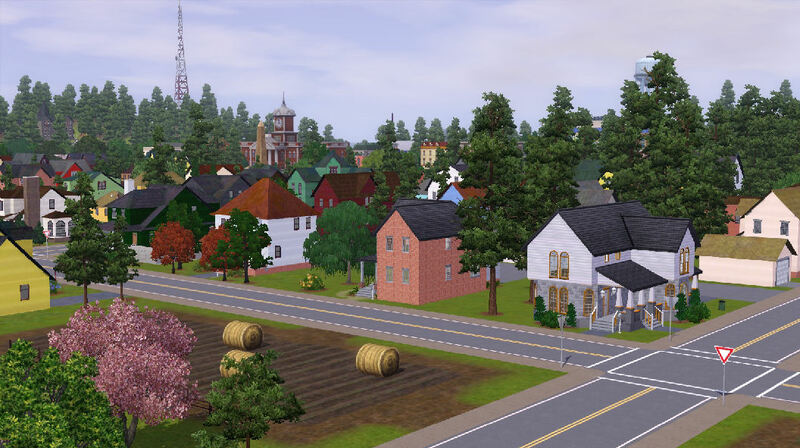 All residential lots are built with homes, save for the test residential lot which contains no furniture, so townies will not move in. Though there are no empty lots, I encourage players who wish to build their own to bulldoze and have at it. 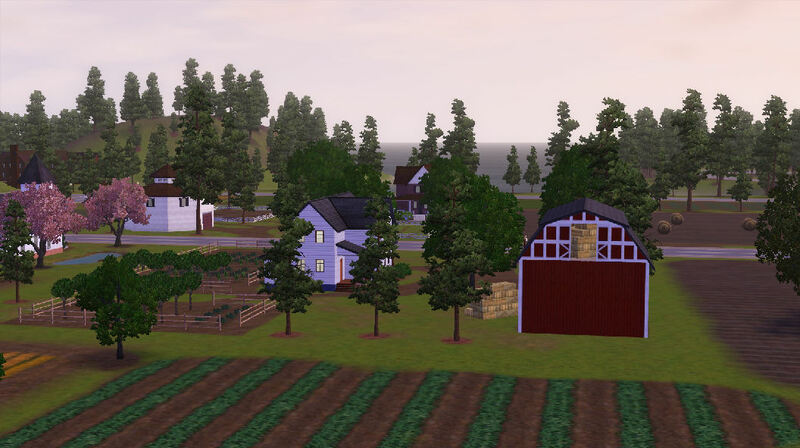 Due to the odd sizes of lots, placing lots created elsewhere may prove difficult. Homes are furnished from elaborate to minimal; I tried to keep the costs down on a variety of different house sizes. * 51 community lots, including all 16 rabbit holes, two art museums, gym, library, pool, and beach. 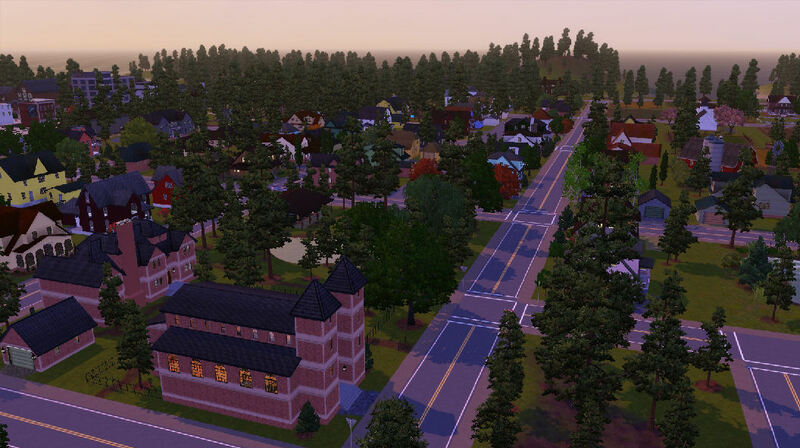 There are four churches, 14 parks [3 are fishing spots], and 11 miscellaneous community lots. * All base game spawners are provided. WA trees and grapes are provided at the orchard/vineyard. 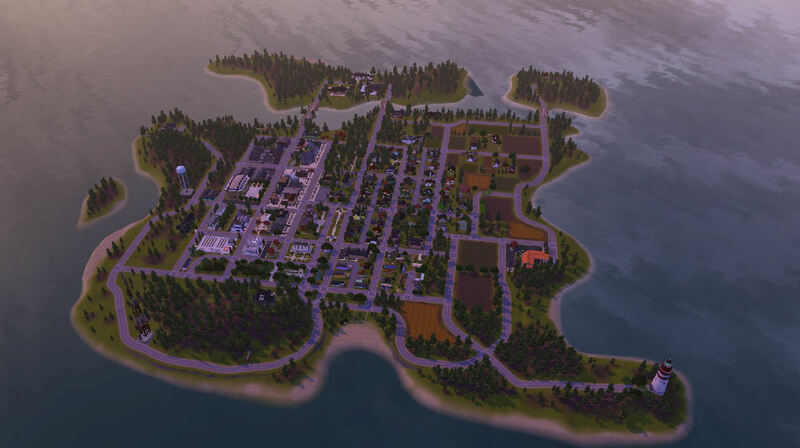 * Sims can route nearly everywhere on the islands and might need to for collection of spawns; the exceptions are the two smallest islands, which are inaccessible due to water [there are no spawns there], and the steep cliffs by the scenic roads next to the ocean. * There are no routing limitations for the camera. * No chunk exceeds the 8 terrain paint limit. * Two layers were used, global and lots. * No custom content was used. * There is a graphic glitch in the waters by "mansion" island. * Carpools will take sims to the backs of the stadium, hospital, and city hall. * Many front doors need to be set as front doors, especially on lots with homes built on foundations and detached garages. 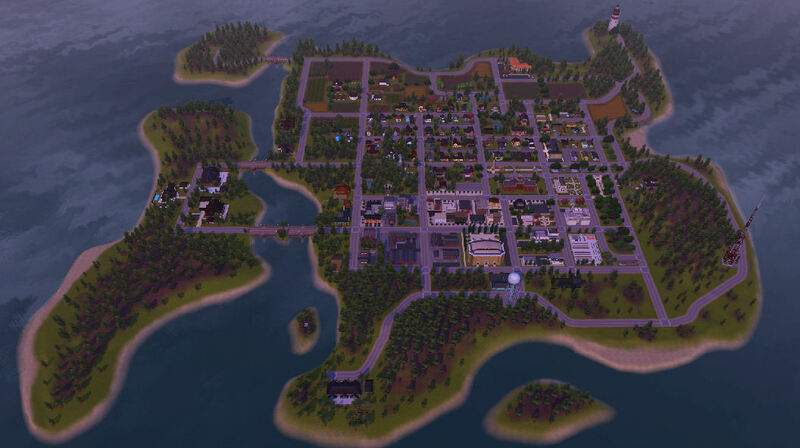 * This is a detailed world with many lots in close proximity. You may experience performances issues. * Download all parts of the rar file. * Extract using your extraction program of choice, such as WinRAR. 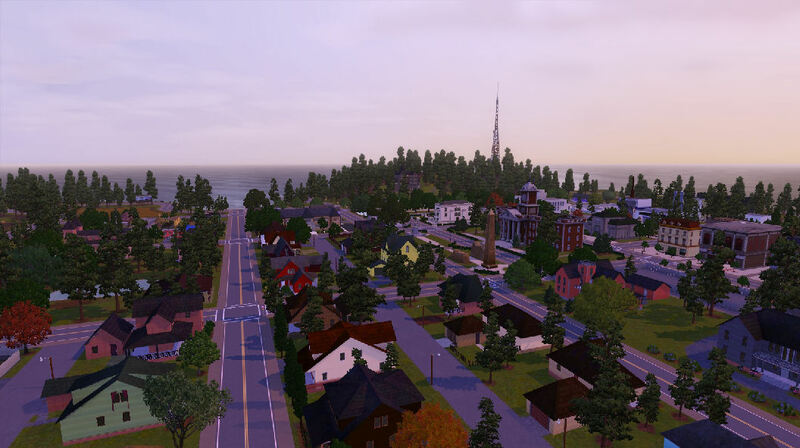 Please see post #2 for detailed street maps and more overview shots. Addition posts have details on the individual lots. EDIT: FINCASTLE WILL NEVER BE UPDATED IN ANY FORM. I'VE LOST THE CAW FILES FOR IT.